It was easy to fall out of the practice of blogging, so now it’s time to finish up. I did keep up a little better than this seems, but I didn’t publish it. Except for one night at Daniel’s after the conference, I stayed with my cousins in Haifa the rest of the trip, taking it easy. Some people would baulk at how I wasted time, but I enjoyed myself. I don’t feel the need to spend all my waking moments on tours and seeing historic sites. I have seen quite a bit and I think it will still be here when I come back in the future. Here’s a quick family tree, as I will mention their names. Lea is my second cousin, once removed. Her husband is Odi. Her kids: Dikla, Tomer, and Lior. Dikla is married to Ido and Carmel is their daughter. Tomer is married to Michal and Noga is their daughter. Lior lives with her parents presently and Daniel is her boyfriend. So what have I done all these days? Let’s see if I can remember. We visited the cemetery in Nesher where Lea’s parents and grandmother are buried. Then there was a party. Lea invited about 40 people on her mother’s side of the family. (I’m on her father’s side.) It was a welcome home to Lior, the youngest daughter, who just got back from eight months in South America after serving her time in the IDF. I also met Lea’s brother Israel and his family at the party. On other days, Lea, Carmel, and I went to the local zoo. Then we met Lior and Daniel for lunch. Lea, Odi, and I went to see HaMinyonim. Lea had mentioned needing some time to stop by her work (she was on vacation my whole visit) and I told her to drop me at the movie, but they said we should all go. They even found it playing in English, though I would’ve been happy with it in Hebrew for fun. It was adorable. The only drawback was that much of the cutest parts were in the trailers. However, the one phrase Minions speak that is Hebrew was worth it to see in Israel. A long drive brought Lea, Odi, and I to the Switzerland forest above Lake Kinneret. We visited Yardenit and watched people being baptized where they thought Jesus was baptized but not quite in the same place; that was a weird one. We drove through Tiberias without really stopping. Visited the Magdala church and the synagogue ruins in front of it that were 2000 years old. And finally we stopped at Kibbutz Amir. This was where Lea’s parents lived until just after she was born. She still has an aunt there. It’s also where the family picture was taken that helped me find them. A shorter trip brought Lea and I to the Israel Valley where we met Lior and Michal for lunch, with Carmel and Noga. Then the two of us drove around to see Nahalal, the first moshav, another moshav, Beit Shearim, and Bet Lekhem HaGalili, or what Google Map calls Bethlehem of Galilee. The Hebrew name is more interesting to me. They sell all kinds of spices and some foods. You can walk through their farm, but it was hot so we just took the quick walk in the front. Genealogy day began in the evening, typical of the Jewish calendar. Lea went through boxes of photos, then I scanned them on their computer. Many were unlabelled and a good collection were mystery people. Under other circumstances, I might have done her mother’s family and even her husband’s, but there was so much. Next, Lea and I went through the family methodically like we did at the beginning and this time she typed it in Hebrew. We still did not finish. But I was able to finish up the family for my database, which I now need to add. I ended my visit with the cousins by visiting Caesarea in the evening. I’m pretty sure a lot of that wasn’t there 30 years ago. 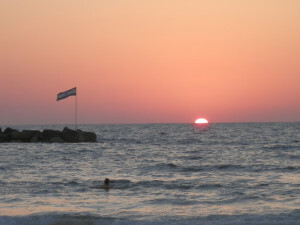 The next day, Lea dropped me off at the train station where I headed back south to Tel Aviv. I visited Beit Hatfutsot and waited for Daniel to arrive. He showed me to the secret room in the basement, after mentioning the urban legend that says they have some of the LDS Polish microfilms, but they never let anyone see them. We mostly spent the day at the Mediterranean Sea. I mentioned to him that I had seen all three major bodies of water, but hadn’t been in any of them. So we walked along the boardwalk for a bit and ended up at the beach. We just hung out there until after the sun went down and I walked into the water a bunch of times. We didn’t change into bathing suits, so I could only walk a little ways in. And that’s about it. Daniel dropped me off at the airport. Security was pretty easy. The baggage check took so much longer; I don’t know why they couldn’t check the bags of the people in front of me in line for so long. The flights home were brutal. I need to learn how to sleep sitting up I guess. I couldn’t stay awake but I definitely didn’t sleep. My mom informed me today that we did swim in the Dead Sea 30 years ago. We don’t have pictures because our tour guide was off eating lunch and we didn’t bring the cameras onto the lake. We had the huge hotel breakfast, but he didn’t. I have no recollection of this, but I remember so little of that trip. I scanned in all of my photos and I had a total of 52 for that three week trip. I joked that I wanted to take at least 2000 on this trip. I made that number easily. So now that I’m home, I guess I have a little more blogging to do about the trip, mostly sharing some of the photos, I think. Watch for those in the near future, but give me a little time. I have to catch up on everything after a three week vacation. 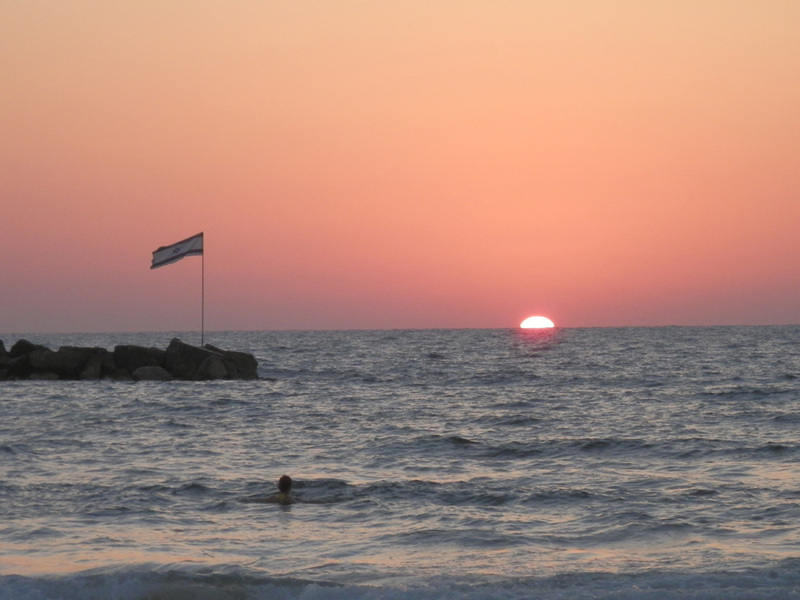 But since it’s easier to upload pictures from home… here’s my last sunset in Israel over the Mediterranean Sea.